Happy Comic Release Day! Welcome to another installment of GeekMom Comic Book Corner, where we recap our adventures in comics for the week. This week we look at Robyn Hood, Gunnerking Court, Will the Real Martian Please Stand up? and Star Wars ! Last week the final issue of Robyn Hood by Patrick Shand (Zenescope) was released and I couldn’t be happier with the ending. I’ll admit it was a little more violent than I typically read, but that part aside, I’m thrilled that Robyn not only got her revenge, but the ending left it open for more stories with one of my favorite heroines. There was a lot of action in this issue and my favorite part has to be when Robyn makes her way back home to Earth to seek out those who wronged her over a year ago. I was a little worried about how this revenge would affect her as a character, but it doesn’t appear to have made a negative impact on her. I almost feel bad for some of those she went after, but at the same time, I feel like they had it coming. After all, these guys were the definition of evil in my eyes. One of them attacked her in a very brutal way. Others stood by and watched it happen and didn’t help. While I don’t agree with this kind of violence happening in real life, we all have to admit… men like Cal exist and they don’t always get what they deserve. After it was all said and done, I had a lot of questions regarding her character and the depth of the violence that occurred to her in the short five-part mini-series that I’ve come to love. Thankfully Patrick Shand was more than willing to answer my questions and I can’t wait for you all to read my exclusive interview with him, here on GeekMom. 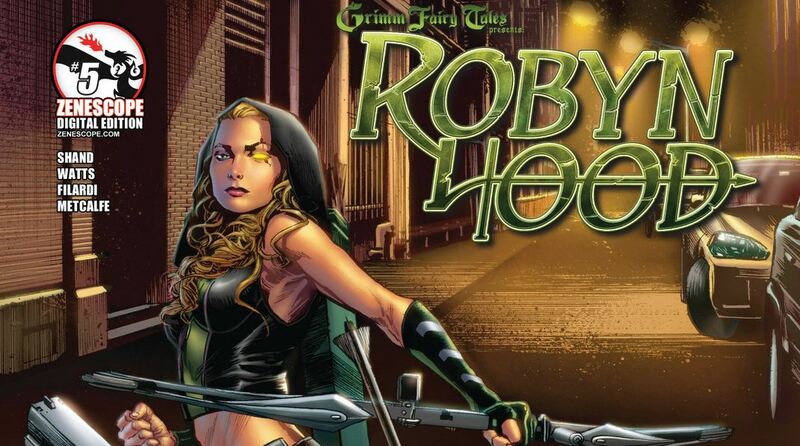 Click on over to see how he answered some of my in depth questions about Robyn Hood’s life, character and the events surrounding her world. Curious to know what I’m pulling this week? Check out my pull list on Comixology. I’ve been anticipating the second issue of Brian Wood’s Star Wars ongoing series, hoping the story will continue to be as compelling as the first issue promised. Star Wars #2 lives up to the first issue and then some, with more insight into the lives of the members of the Rebellion along with the introduction of intriguing new characters in the Star Wars universe. The second issue takes a look at what Han Solo and Chewbacca are up to in the weeks after the Battle of Yavin IV. I can’t imagine how difficult it is to write dialogue for a conversation with a Wookiee; Han has to basically repeat Chewie’s side of the discussion before adding his own two cents to keep the repartee going. Wood pulls this off admirably so that the reader understands what’s being said without it becoming repetitive. We’re introduced to new characters in the form of the elite team under Leia’s lead, and I’m looking forward to seeing the squad in action. I’m not quite as hooked on the machinations of the Imperial Colonel Bircher, but mostly because I am eager to see what Han, Luke, and Leia are up to. The art by Carlos D’Anda also continues to impress me. The X-Wing action is explosive and spectacular. With the additional bonus of another fantastic cover by Alex Ross, I’m sure Star Wars #2 will fly off the shelves as fast as the first issue. A promotional copy was provided by the publisher for review purposes. Sophie Brown– Will the Real Martian Please Stand Up? Every other Saturday the library bus parks in my village with its minuscule collection of graphic novels (seriously, there’s usually less than three) so it was a pleasant surprise to spot something I actually fancied reading as I hunted down books for my toddler. Will the Real Martian Please Stand Up? 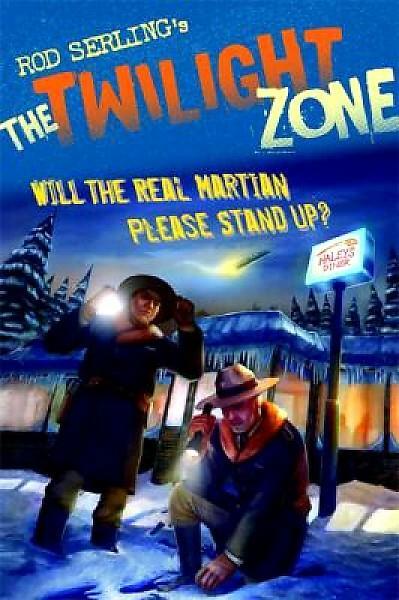 is a graphic novel adaptation of The Twilight Zone episode of the same name, originally broadcast in 1961. It is one of eight episodes selected to be published in this new format in an attempt to draw in a new young generation to Rod Serling’s classic tales; as a result is has been adapted with younger readers in mind. The story begins as state troopers investigate a supposed UFO, finding footprints in the snow that lead from the frozen lake where the ship is believed to have crashed up to a nearby diner. In the diner are the driver and passengers of a bus stranded due to a dangerous bridge up ahead, only there is one more person than there should be. The story unfolds as the people in the diner become increasingly suspicious of one another in an attempt to root out who among them is the alien intruder. In this respect the story is reminiscent of the Doctor Who episode “Midnight“, although of course this tale was penned many decades earlier and so if anything, that episode was inspired by the Twilight Zone. The novel is adapted from the original screenplay by Mark Kneece, who has also worked on Batman: Legends of The Dark Knight , and illustrated by Rich Ellis whose current project is the Memorial series. On Monday a new comic book will launch online that’s a little different to other comics on the market. Written by Will Brooker ( Batman Unmasked , Hunting the Dark Knight ) and illustrated by Suze Shore and Sarah Zaidan; My So-Called Secret Identity has almost entirely female staff and is a not-for-profit enterprise that donates regularly to women’s charities. The story follows Cat, a young Irish-American cop’s daughter in her early twenties on her adventures in Gloria City, where if you’re not in costume then you don’t matter. Issue one will go live to the public on Feb 18th but for now you can check out the comic’s Facebook page which has previews or follow the team on Twitter for the latest news. Check back to GeekMom on Monday for a review of issue one and more information about the making of the series. This was a great chapter, not for any huge plot events, but it actually made me laugh out loud. First we get to see Shadow find a place to be safe and learn. Jones helps out secretly in this with Annie. Then Annie visits a classroom of the fairies from the forest who have become human. I can’t say I was a fan of the two characters Annie met in previous chapters because they were obnoxious, though kinda amusing. But in this chapter, we see the “culture” of this group, which is really funny. The page where Red responds to her friends…well, juvenile humor was never better drawn. And the character guide was so hilarious. If you’ve never read any of this series, check out this chapter, be amused, and then maybe you’ll be intrigued enough to go back and catch up on the main plot-line. Liked it? Take a second to support Dakster Sullivan on Patreon! Dakster Sullivan is a network administrator by day and a cosplayer by night. She loves discovering new books to read, tech to play with, and ways to express her herself. She has anxiety and depression and strives to educate others about these invisible illnesses.